Space opera brought to life. 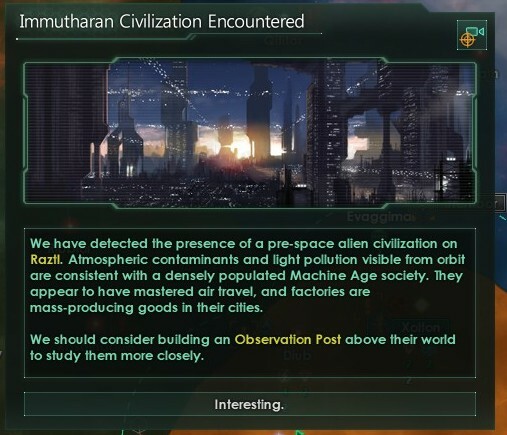 Better than many science fiction games, Stellaris takes advantage of its setting. It feels like science fiction: there are precursor artifacts, ringworlds (both inhabited and shattered), and multiple variants of the Sol system that can be discovered. 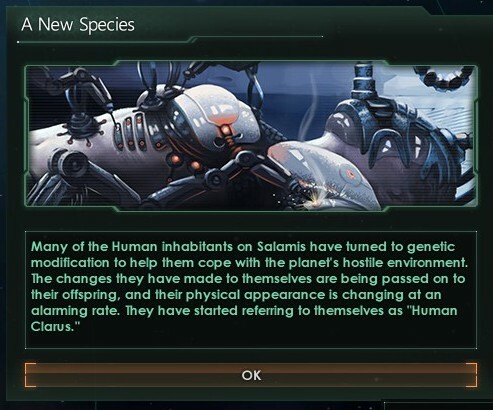 You can uplift pre-sapient species, meddle with pre-spaceflight worlds, and genetically modify your own people. Your own people can genetically modify themselves! This approach manifests itself in several game mechanics. 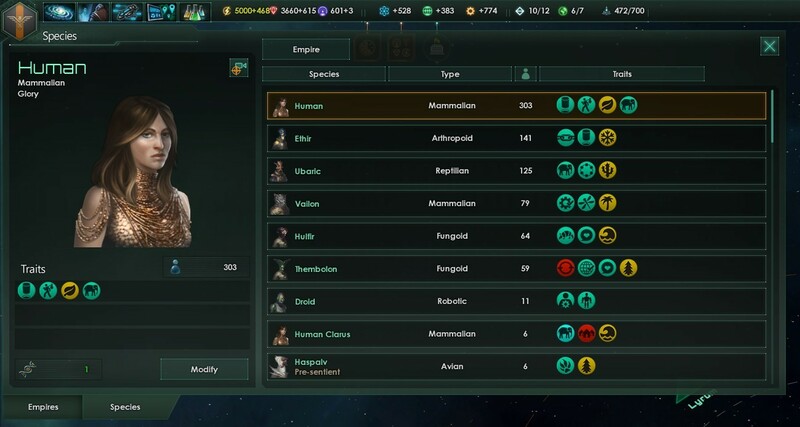 For instance, I love the way Stellaris represents multi-species empires — different species prefer different types of planet (and often start with different ethics). From a mechanical perspective, it gives players an incentive to expand – acquiring synergistic species – beyond growth for its own sake. And from a thematic perspective, it makes perfect sense. For another example, consider Fallen Empires. From a mechanical perspective, they’re superfluous – they keep to themselves unless provoked, and for most of the game, they’re far, far too strong to provoke. By the time I could beat the Ubari, I didn’t need the rewards. Essentially, they’re optional bosses for players who want a challenge. Their real value is thematic: they flesh out the galaxy as a place that existed long before the first player-controlled empire lifted off into space, and that will exist long after. The music. This is perhaps Andreas Waldetoft’s best soundtrack to date: at times mysterious and tantalising, and triumphantly swelling at other times. I have it on loop as I type this. 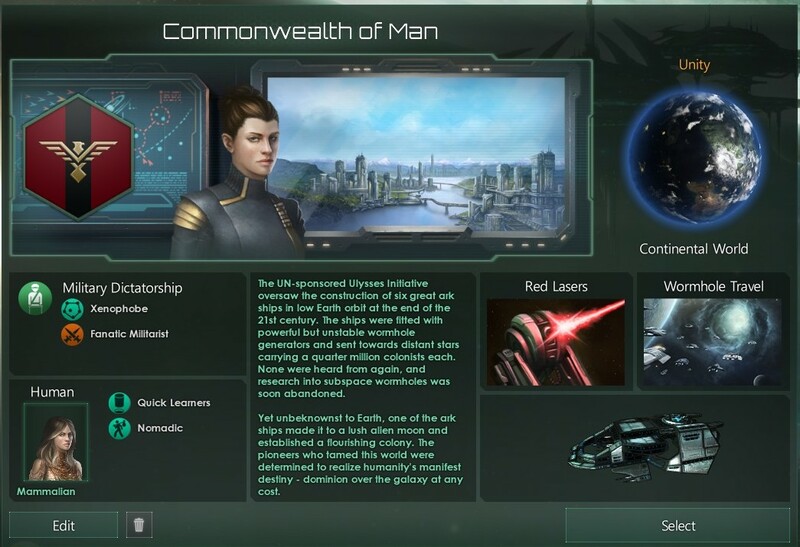 Now contrast the leader of the Commonwealth of Man, Stellaris’ human militarists1. Her uniform is overtly martial — and the wall behind her is a tactical display. One glimpse highlights the difference between these factions. There are similarly cool touches in the flavour text. While the game usually refers to unidentified alien fleets as “Alpha Aliens”, “Beta Aliens”, and so on, the warlike Shimmering Stars classified unknown vessels as “Alpha Bogeys”. Internal politics – an obvious candidate for future expansion. 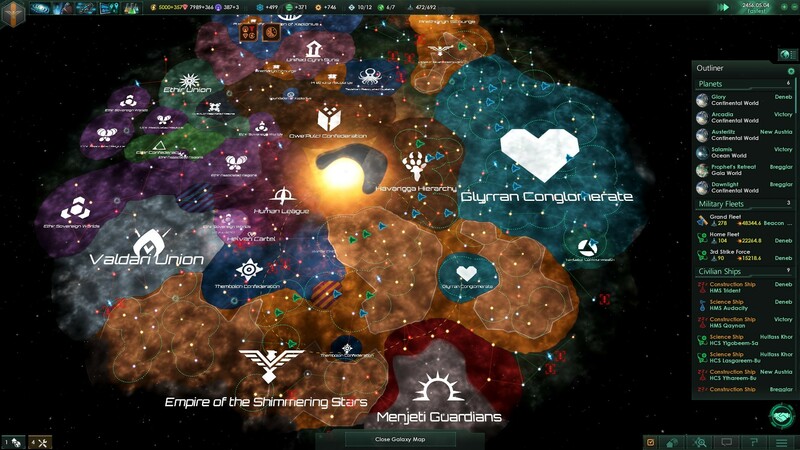 Stellaris already contains the necessary framework, given that empires are populated by different ethics, factions, and species, and large empires are mostly delegated to computer-controlled sector governors. 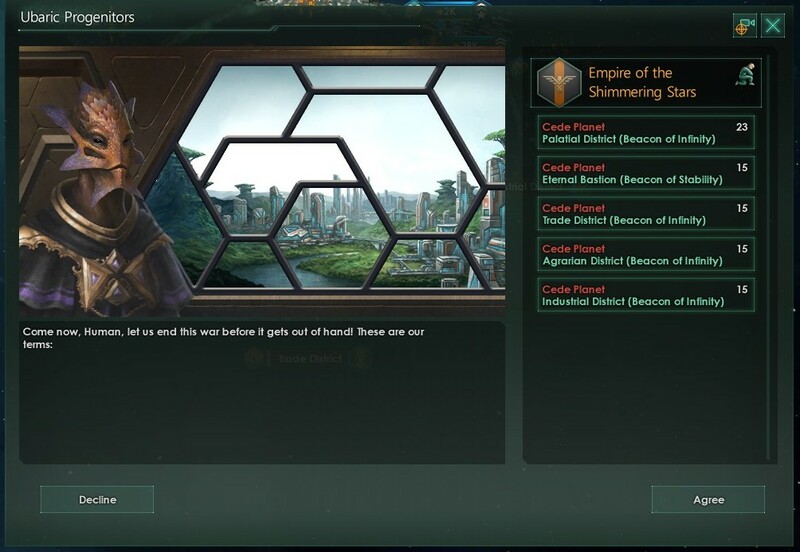 However, the peoples of my empire rubbed along pretty well (with the exception of the conquered Ubari), and as far as I can tell, the overall ethic/ideology of an empire is set in stone when the game begins. Contrast Paradox’s Victoria series, in which political ideologies emerge over the nineteenth and early twentieth centuries. 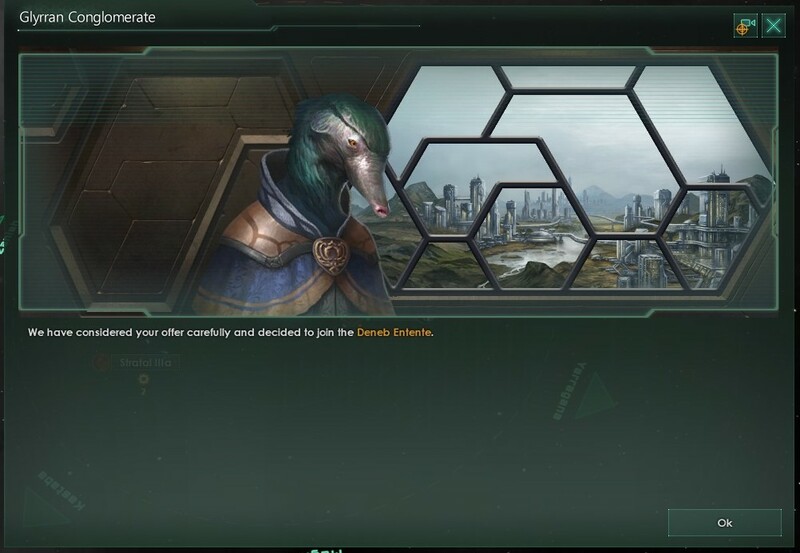 Different ideological groups in Victoria vote differently, and different political parties allow the player to enact different policies; I can see something similar working in Stellaris, where an empire’s founding ethics already have some effect on diplomacy and available domestic policies. Victory conditions a disappointment. 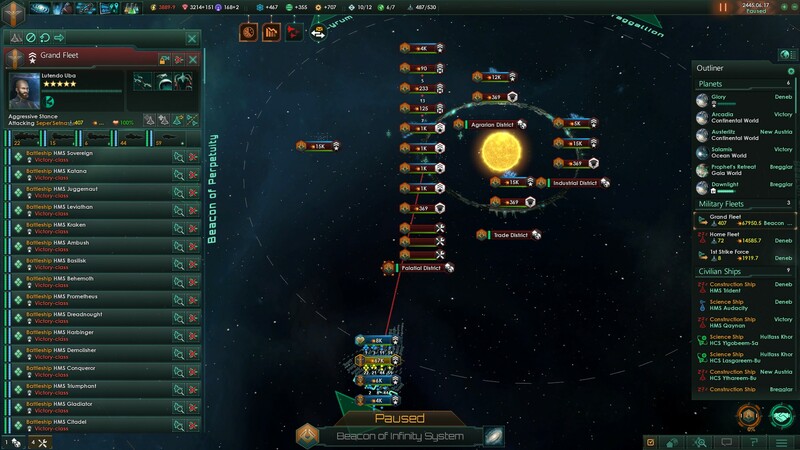 Currently, the game has two victory conditions – “eliminate all other players” and “colonise a huge proportion of the galaxy” — a recipe for the lategame grind that bedevils so many strategy games. I would like to see more varied victory conditions, and at the very least, customisable thresholds for the existing conditions. 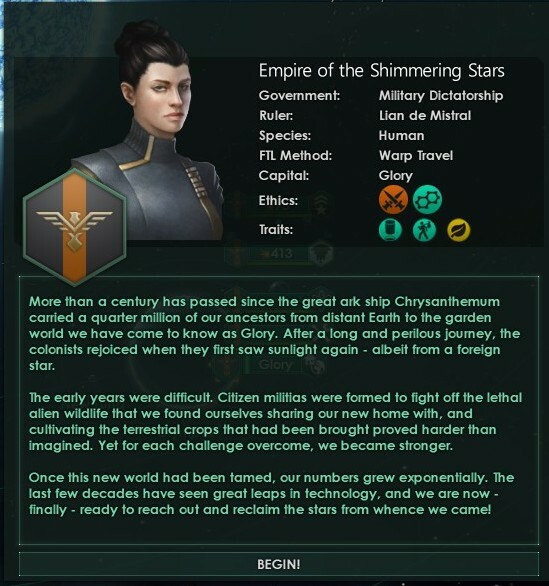 In particular, the absence of a diplomatic victory is odd, given Stellaris’ innovative alliance and Federation mechanics. Similarly, the absence of a science, quest, or wonder victory feels odd in a science fiction game where these can be justified with technobabble about transcendence and precusor artifacts. For now, I’ve simply set my own goals (in traditional Paradox GSG fashion), with the option of calling the game quits when I’m bored. With the Shimmering Stars unmatched, I consider the game won. Gameplay bugs need squashing. Several notable examples: on two occasions, my main fleet was ‘stuck’ in combat, unable to move or deal damage – I had to fix this by bringing up a second fleet. Had I not had a second fleet, this could have been a game-breaker. And one of the endgame menaces is currently bugged — I had to install a mod to fix it. … and UI could do with a pass. 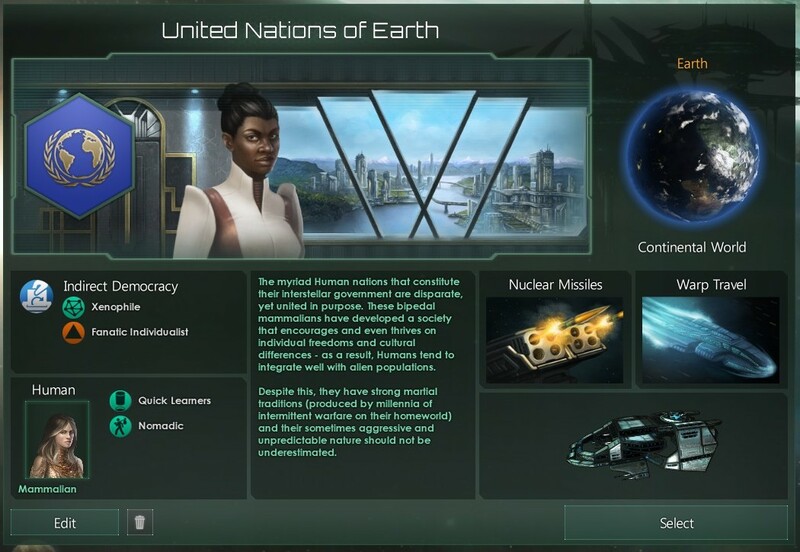 While there’s a lot to like about the UI, it could do with Paradox’s traditional ledger (I’d especially like a sortable list of habitable planets within my borders), an auto-explore button, and a way to easily queue up construction at multiple space stations, similar to the army and navy recruitment buttons added later in Europa Universalis 4’s life cycle.